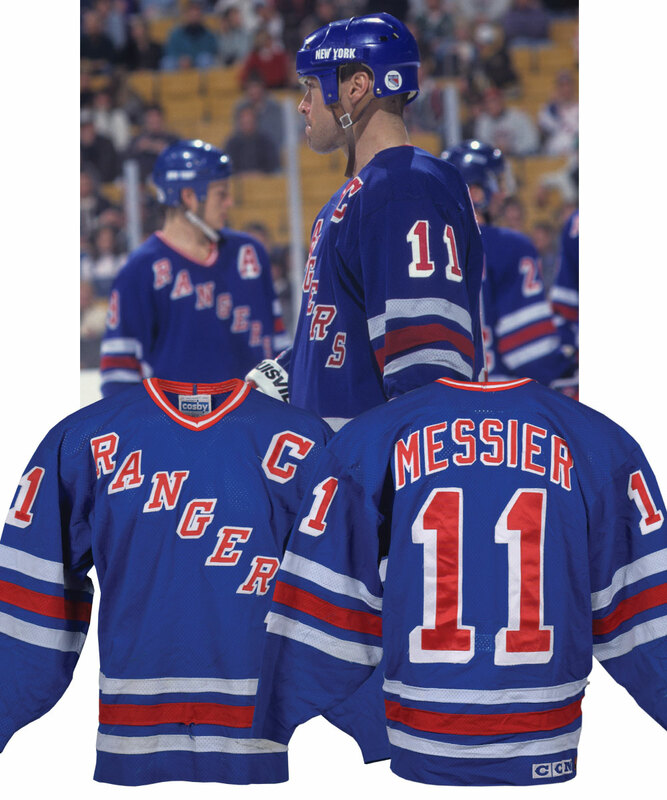 Lot Detail - Mark Messier's 1994-95 and 1995-96 New York Rangers Game-Worn Captain's Jersey - Nice Game Wear! - 47-Goal Season in 1995-96! - Photo-Matched to Both Seasons! Mark Messier's 1994-95 and 1995-96 New York Rangers Game-Worn Captain's Jersey - Nice Game Wear! - 47-Goal Season in 1995-96! - Photo-Matched to Both Seasons! The only player in history to captain two different professional teams to championships, Mark Messier first witnessed major league hockey playing in the WHA while still a teenager, skating for both the Indianapolis Racers and Cincinnati Stingers. A dozen successful seasons in Edmonton would follow, with Moose then transitioning to The Big Apple in 1991-92 for his first of two stints with the Blueshirts. An instant leader on Broadway, Messier would take the Rangers to a first-place finish his inaugural season, sitting atop the club’s scoring race with 107 points. It would take just another pair of seasons for the Edmonton native to lead New York to the Stanley Cup finals, with his well remembered “promise” - guaranteeing a Game 6 victory over New Jersey in the Eastern Conference Finals the stuff of legend. 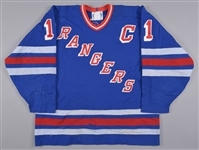 Originating from the his 500th goal-scoring NHL season of 1995-96 – a campaign that witnessed the HOFer again lead New York with 99 points – we have a Rangers captain’s jersey that was worn by Mark Messier, and it’s been photo-matched. A CCM laundering tag and partially-detached Gerry Cosby label sit along the collar with a size “52” fly tag, with embroidered NHL and CCM crests over the reverse bottom hem. Styled with “Rangers” placed diagonally across the chest in individual red with white drop-shadow tackle twill letters, the knit mesh V-neck has been accented with sleeve and verso numbers in matching material. Exhibiting tremendous use, large stick marks and burns are visible over the lower front, with additional burns and paint transfer over each sleeve. There are also small holes over the left shoulder, at the top of the left sleeve’s striping band and over the right elbow, along with a small separation along the lower front band. Regarding the previously mentioned photo-matches, a number of included images along with a Dec. 15th 1995 Getty Image (#221726), six high res numeric images and images of two 1996 hockey cards have been matched to; the small black mark on the second "1" on the left sleeve, as well as to a number of loose threads on those numbers; to the black mark on the lower white stripe on the left sleeve as well as to the small unrepaired hole to its right; to the small unrepaired hole on the lower right side of the jersey in the upper white stripe; to the long black mark on the lower front of the jersey in the lower white stripe; to the long loose white thread on the left lower left edge of the captain's "C", to the washed-out diagonal black mark on the lower portion of the "S" of "Rangers" and to the white loose thread on the bottom of the second "R" of "Rangers". 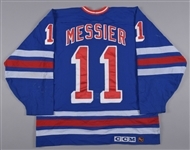 With Messier sitting third atop the all-time points list, this jersey is a must-have for any true Messier, Rangers or HOF collector. Addendum; The jersey was also worn in the 1994-95 season and is photo-matched to the May 6th 1995 Conference Quarterfinals playoffs game #1 in Quebec City. A screenshot from the game provided to us by Casey Samuelson clearly shows numerous loose threads on the nameplate and other matches on the nameplate as well. A DVD of the game will be included. Auction closed on Wednesday, June 20, 2018.